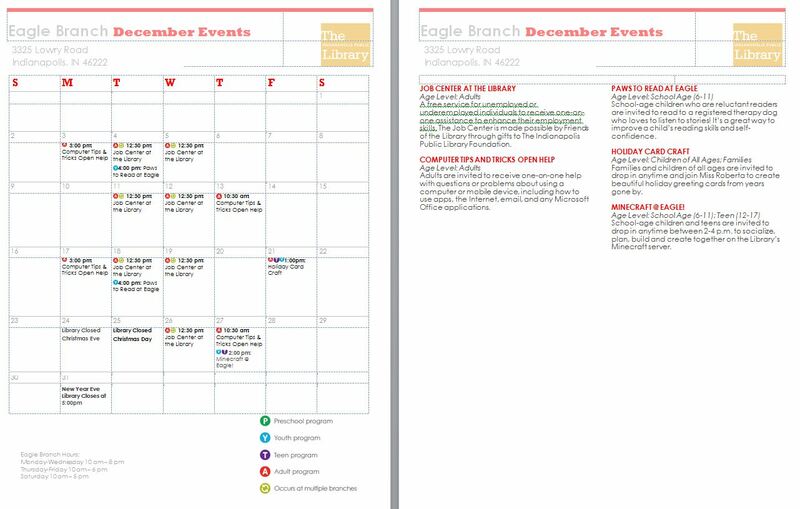 Attached are the calendars for the three libraries who are closest to our area – Wayne, Eagle, and Pike. While we are all extremely busy this time of year, it is always nice to sit and relax with a good book to read. Our libraries are more than just books, and they offer a lot of really great programs for all ages. 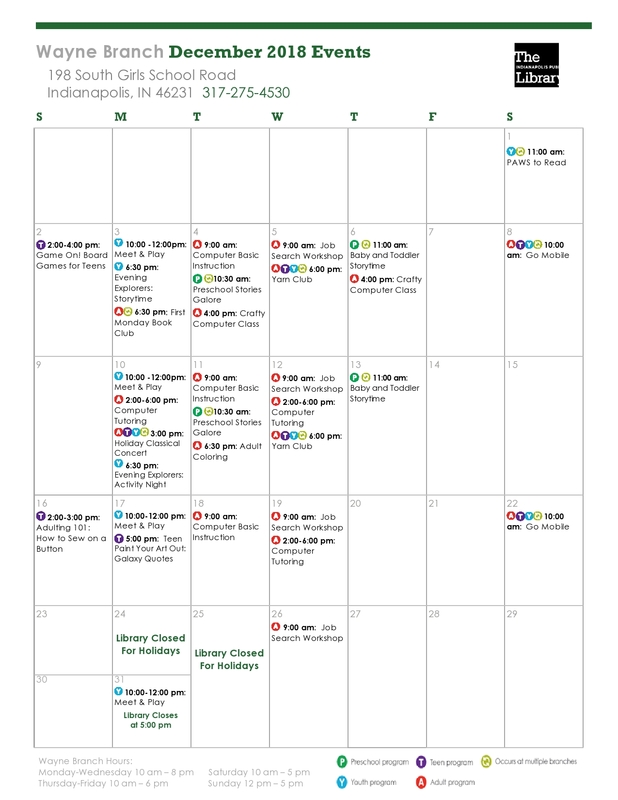 One terrific program this month at the Wayne and Pike branches is the “Holiday Classical Concert” which features the Indianapolis Symphony Orchestra’s Chamber Ensemble. They will play Holiday Classics and Carols. The Chamber Ensemble will be performing at Wayne on Monday, December 10th, from 3 p.m. – 4 p.m. and at Pike on Wednesday, December 12th, from 3 p.m. – 4 p.m. What a wonderful way to spend some time at the library and enjoy the music of this group from the Indianapolis Symphony Orchestra. 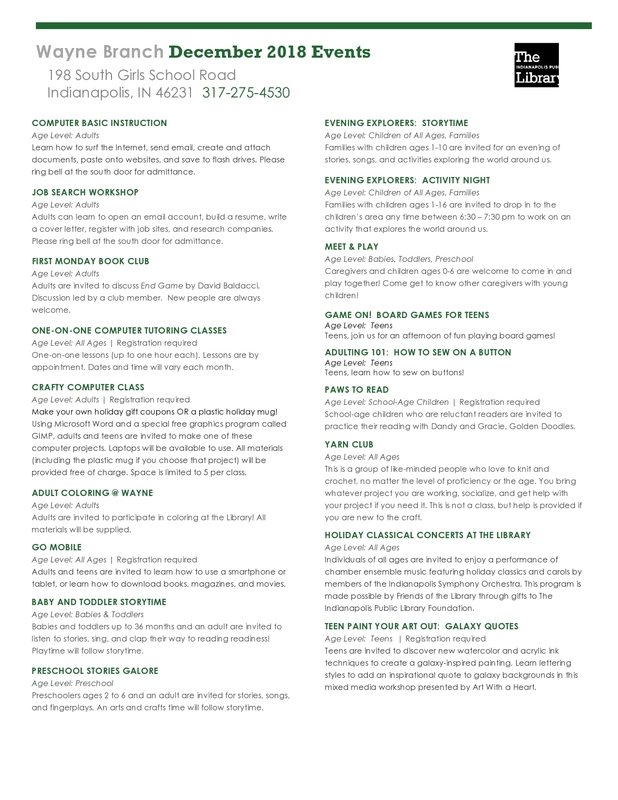 All of our libraries are having the the “Jingle Books” Program again this year. This is where you may drop off into a box a new or gently used children’s book to donate, or you may select a book from the box to give to a special boy or girl in your life that would appreciate receiving a book of their own to read and cherish. There will also be wrapping paper available to wrap the book at the library. 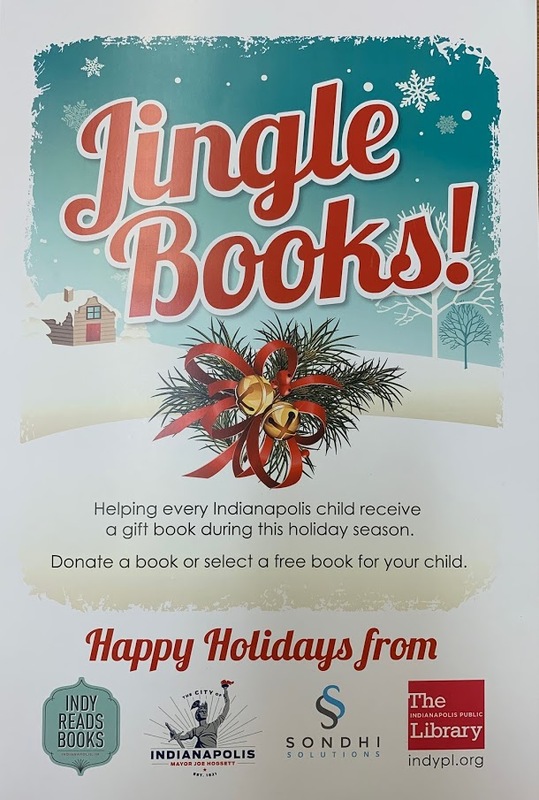 So, if you have some gently used books that your child or grandchild has outgrown, or would like to purchase a new children’s book to donate to the “Jingle Books” Program, they will definitely find a good home (the libraries could use some donations of wrapping paper as well). If you would like to give a book to a special child, you may select a book for them from the box. Help the libraries make it possible for children to receive a book of their own for Christmas. See the attached for more information. Please feel free to pass this information on to others, not only in our district, but in the area that these three libraries serve. I know that the Librarians would appreciate your help in getting their calendars out and also information about the “Jingle Books” program.